Caution. If any grooming attempt might result in a bite, seek the help of an experienced professional. to ensure their pets don't have pain or other medical issues, pet parents might consider simply changing instruments. I have lived with several dogs who tolerated a comb much better than a brush. I've had several very nervous dogs do well with a double rowed rake. 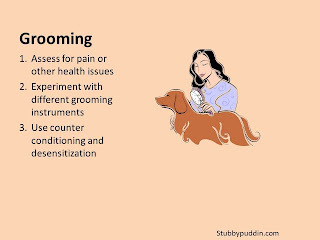 If a pet doesn't respond well to any type of brush or comb, then pet parents might consider counter conditioning and desensitization. 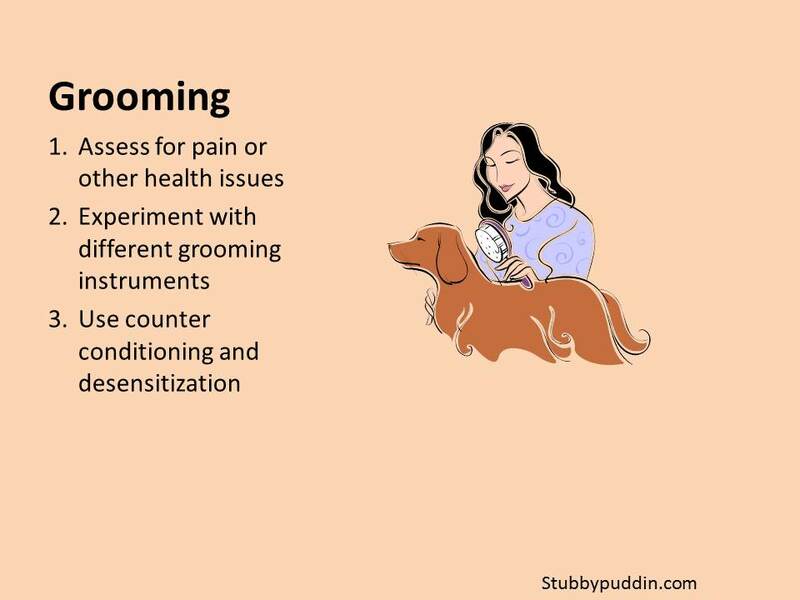 Break down the brushing process into teeny tiny bits that the pet can handle, and reward after each step. Below is an example. For some pets, this process might take a couple of days, for others a couple of months. Pet parents need to try and go at the pets' pace - never progressing to a point where the animals are uncomfortable. 1. Without an instrument, reach toward pet, mark and reward. Continue this until the pet is looking forward to the reach. 3. Then try raking your fingers through the dog's fur. Start off doing it just once, mark/reward, then take a break. Later you can stroke twice, mark/reward, take a break, etc..
8. Brush or comb pet for one stroke, mark/reward. Then go do something fun. Don't attempt anymore grooming on this day. Next day, try one stroke again. Next day, try one again. If dog seems to enjoy it, then try two strokes then mark/reward and so on. Be sure to take at least a short break after each reward. Note - do not flood the dog. If the pet appears to be uncomfortable at any point in the process, back up to a point where the pet was having fun.